- Life, Death, Happiness and Stuff is Ske's debut album. Although Ske is a new band and Life, Death, Happiness & Stuff their first album, the core members have been writing and playing music together for years. Eirikur, Frank and Gudmundur founded the band Skarren ekkert (Better Than Nothing) in 1992. They met each other in college and didn't find the music scene of the time very inspiring. They decided to start a band where the instrumentation would be in contrast with the conventional pop music, i.e. accordion, acoustic guitar and a double bass. They started playing instrumental music, mostly from the Fellini movies but also music by Les Negresses Vertes, Tom Waits and The Pogues. The venues were mostly cafes in Reykjavik, weddings, cocktail parties and such. This is what the band members now refer to as "The Era of Cocktails and Fingerfoods". 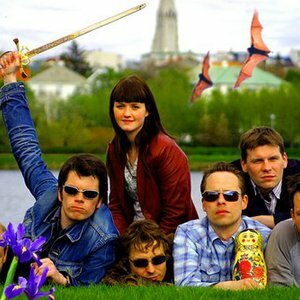 In 1994 the band had gained attention in the Reykjavik music scene, especially among people in the arts and theatre. As a result, the band was offered the opportunity to write music for The Cherry Orchard by Anton Chekhov. The play was being produced by an independent theatre group and was released by the company in a limited edition which is now sold out. The debut of Skarren ekkert in the theatre was successful, so Skarren ekkert were stuck in the theatre for the next eight years, writing music for numerous productions in films and theatre, including two works for the Icelandic Dance Company and The National Theatre's 50th anniversary production of Midsummer's Night Dream. This career in the theatre was never the band's intention. They were always looking forward to making their "own" music and releasing an album. However, they kept being offered exciting and challenging projects in which they had the opportunity to evolve their own unique style. The band had always been acoustic and its musical approach had been minimalist and raw. Around 1999, Hrannar joined the band and they got interested in using samplers and computers in making music and by combining that with the acoustic, instrumental background, they created an offbeat mix of electronic and acoustic music. Finally in 2001, Ske was born and they started writing music - not for a theatre production - but for themselves. The band spent considerable time making the record, financed by returning to "The Era of Cocktail and Fingerfoods" - playing in receptions, wedding parties and writing music for television shows and advertisements. Thor Eldon of Bad Taste Inc. got his hands on the record by some means. He and the others at Bad Taste liked it and contacted the band wanting to release it. The result is Life, Death, Happiness & Stuff, it's a little bit experimental, a little bit cute, a bit dramatic and sometimes even a little bit square. Japanese lullabies, french romance, sleazy stomp and everything in between - It's Life, Death, Happiness & Stuff. Ske second album, titled Feelings Are Great, is being released in Iceland the 11th of October.